W.R. Myers Rebels girls rugby team got its regular season started off on the right foot with victories against Chinook Coyotes on the road last week. The varsity Rebels earned a 24-15 victory thanks to a strong first half, with scoring tries from Alex Haller, Halle Johnson and Emily Hoyt. Hoyt also converted two of three tries. The second half was a different story, where the Rebels struggled, but still managed to hang on for the victory. The junior varsity match proved much more lopsided, with the Rebels blanking the Coyotes 30-0. Hayley Jones scored two tries, and Abby Wood, Emily Hoyt, Darci Wright, Jenna Bailey all scored one. “The JV team put on a strong overall display, shutting out the Coyotes, and running the ball in six times. It was great to see a number of girls playing for the first time shine,” said Hughes. 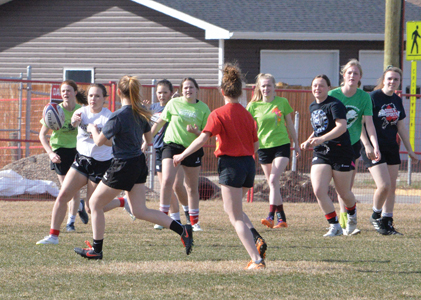 The Rebels will have their work cut out for them on Thursday when they host the strongest girls rugby program in the province in the Raymond Comets. Varsity plays at 5:30 p.m. and junior varsity plays at 6:45 p.m. at Ken McDonald Memorial Sports Park.